Bought from Gearbest for $207, Cheerson CX-20 Auto-Pathfinder is my first Brushless GPS Enabled Quadcopter. resembling DJI Phantom, CX-20 looks good and professional when it comes to design, build quality and features. In this review i will detail my Flight Experience, Feature Highlights, Battery Performance, Flight Characteristics and a bit of Aerial Photography with CX-20. CX-20 comes disassembled in a big package, the component parts are well packed in the individual boxes, including the Manual, Tools and the CD. Out of Box you see Battery, Balance Charger, Aircraft support (Landing Skids), Remote Controller, Camera Mount, Propellers and the big white CX-20 Quad itself, with the bare brushless motors, with prefixed removable propeller caps on top. Before actually getting the CX-20 assembled, relax and spend some time reading the manual. Simultaneously, charge the battery, as it takes 2 plus hours for a complete charge cycle.I spent almost an hour to make my CX-20 Ready to Fly. Some Sequence while assembling, Remove the Propeller caps, though the silver propeller caps were easily unscrewed with the hand, the black caps on the top of the motors were hard to remove and i had to use the wrench tool to get them off of the motors to equip the propellers. Make sure you rotate the caps in the direction that is marked on the quad. First, Install the Landing Skids(Aircraft support) and then the propellers, match the direction on the propellers as marked on quad, do not tighten the caps too hard. 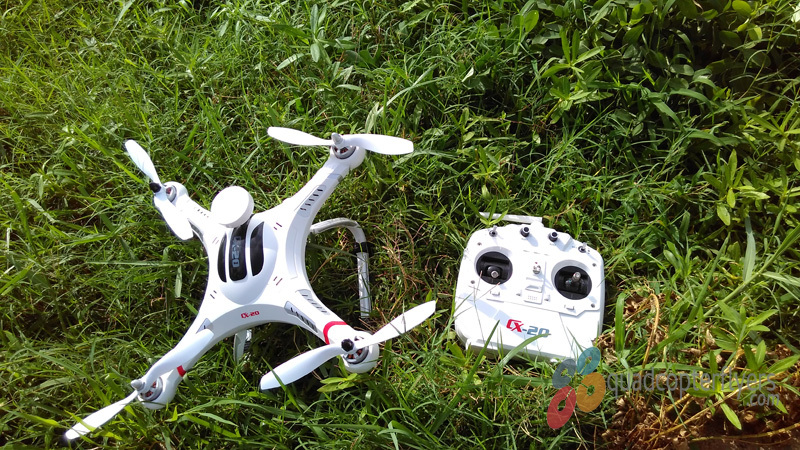 Install the 4 AA batteries in the transmitter and you are good to go! Connect the Cx-20 battery to the battery terminals and secure the battery compartment cover, make sure you locked the cover well. I am specific on this point for the reason, my battery compartment door was opened during my flight and one fourth of the battery was out and i had to immediately,land it safely. 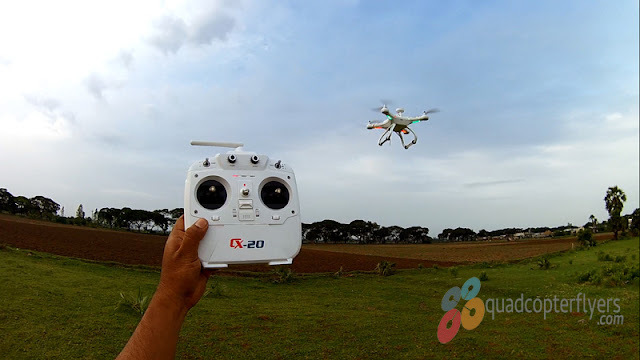 My first Flight with Cx-20 was outdoor, under mild wind conditions. 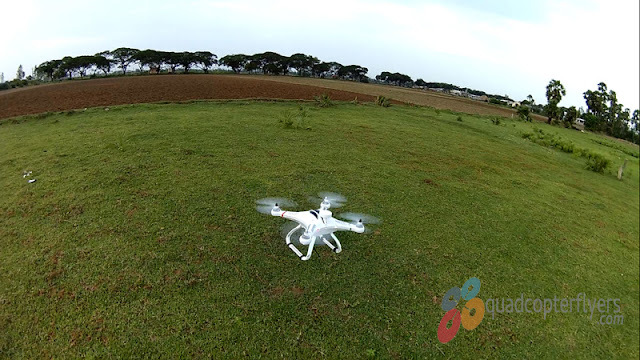 Felt big and heavy when it actually took of the ground for first time, definitely felt brush-less motors. 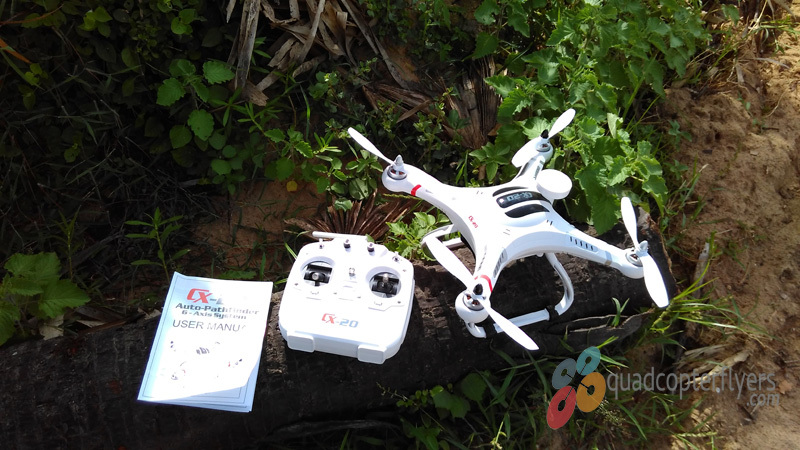 Took some initial, small low flights to understand the Cx-20 and its behavior and response to the controller.As i got used with its response, sent far with the Headless mode aka (no Nose Mode/Orientation Mode) enabled , didn't really bothered about the orientation of the quadcopter. 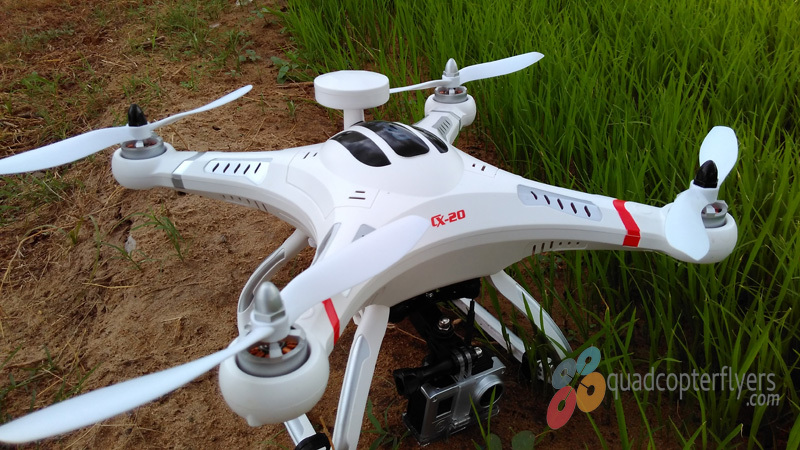 CX-20 Auto-Pathfinder Quadcopter is an absolute stable flier with smooth forward, backward and sidewards transitions and absolutely this is not a fast quad to thrill speedsters. 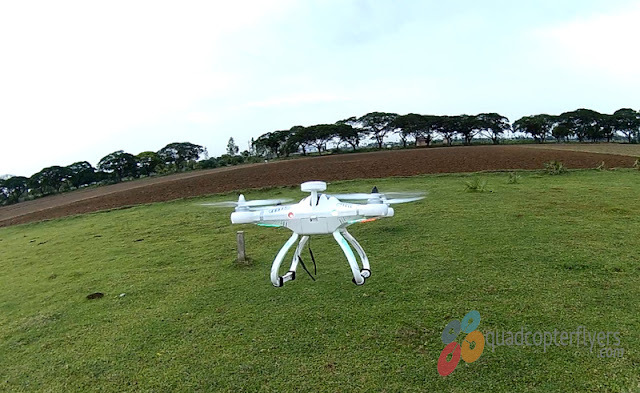 On the flip side, aerial video enthusiasts will love flying CX-20. 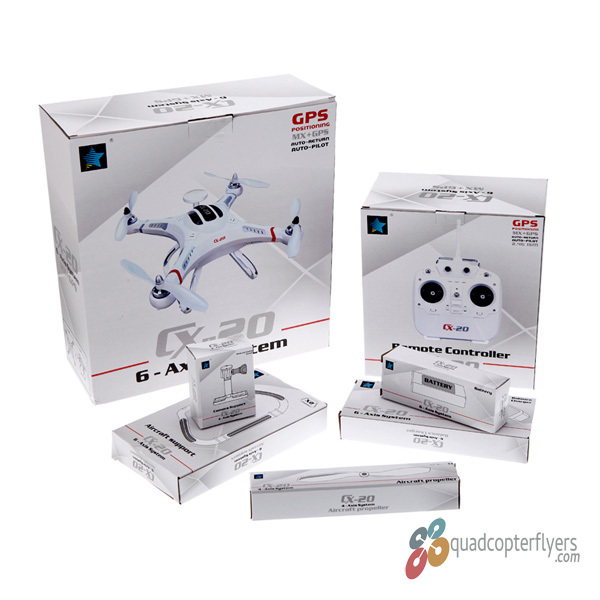 The better you care and understand the CX-20, you will have a blissful flight experience. 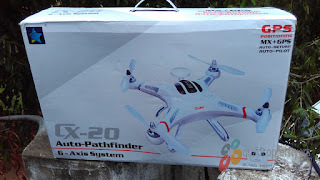 Indeed, all the features of Cx-20 Auto-Pathfinder functioned as advertised, though its bit tricky to get into the GPS positioning mode, the altitude mode worked perfectly. Probably, i need to give an another try in no wind conditions, balancing the throttle stick to the middle, was the key, i believe. Along side, Return to Home and Fail Safe features excited my flying, CX-20 Return to home was reliable and accurate enough to land safely. In-addition the fail-safe feature comes handy in a scenario of signal and communication loss between the transmitter and the receiver, the quad would automatically trigger return to home and land safely, a good feature for new flyers.Though haven't got chance to cruise the quad to 300 meters and above, 300 meters is a respectable control distance. Another important point to mention, Low Voltage Protection, auto-Pathfinder comes with two levels of the Low voltage protection system, to prevent the CX-20 multi-rotor from crashing or other unavoidable consequences caused by low battery voltage, At a first level, the quad beeps to warn you about the Low voltage but you still get 1 to 2 minutes of fly time to land the quad safely. The second level will automatically trigger the quad to land itself. CX-20 also comes equipped with high intensity Led Lights, The bright Green and red LEDS are extremely useful in low-light and for night flight to guide the orientation of the quadcopter. 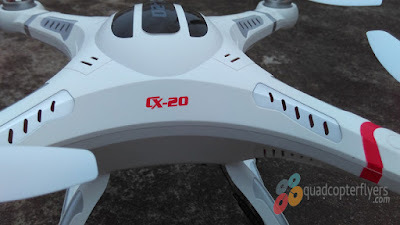 CX-20 Drone includes a 11.1 volts 3S LiPo battery with the capacity of 2700mAh and weighing 180 grams.the battery looks solid and well built, seems like re-branding of fully-max Lipo . The Charging time was around 2 hours and above for a complete single charge cycle.The flying time definitely varied with and without the camera installed. My flight time was around 12 to 15 minutes with no camera and with Amkov 5000s mounted, the flying time was 8-11 minutes, fair enough.I recommend buying an additional spare battery sold for $28, for extensive flight experience. Cx-20 Transmitter is simple, big and comfortable to Hold and control.CX-20 does not come with any kind of LCD screen or mount options, The front of the transmitter has two switches, a pair of trims, two aux adjusters and an antenna at the top along with the light indicators including a buzzer mesh and a battery compartment at the back.What i like most about the the transmitter is the look and feel, the Throttle and Aileron sticks looks professional for smooth manoeuvrings. 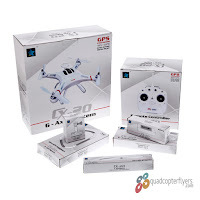 Absolutely, CX-20 is a quad for Aerial Filming, the package includes a camera mount to equip a GoPro sized camera and a vibration dampener support equipment to eliminate the jello effect, there is no real help in the manual to install this, though its easy to setup. I used my Amkov Amk 5000s Sports Camera, as it perfectly fits the mount and can record at 1080p at 30 FPS, Xiaomi Yi was too big to fit in. In addition I used the Amkov support Accessories to Extend the camera forward, to eliminate the Landing skids in the video, see the below images. Honestly, really couldn't feel the difference flying Cx-20 with and without the camera equipped, but full charge of the battery does matter when you are flying with the camera, though the flight time reduced with the additional camera weight and support extensions.I got around 9-11 minutes of flight time with moderate to aggressive flying, below is my first test flight video with Amkov 5000s camera Equipped. Bottom Line, the more you love and understand this quad, the better you fly! Don't miss experiencing this quad in your lineup and i don't hesitate to rate 4.5 out 5 stars! 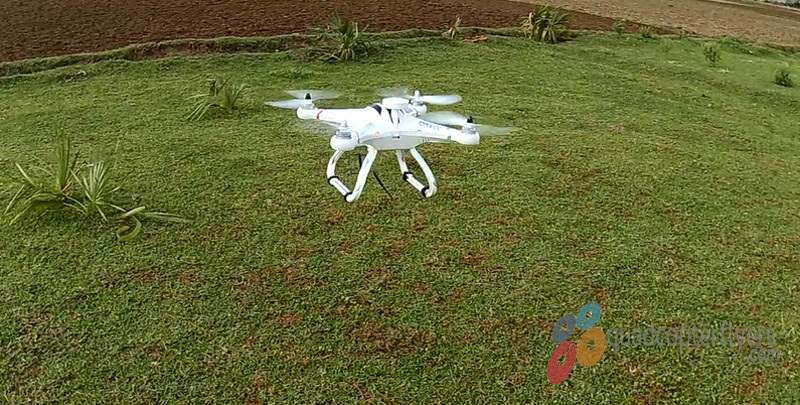 As the Propellers are all white, its difficult for the initial flyers to distinguish front and back of the aircraft and i recommend flying this in orientation mode. 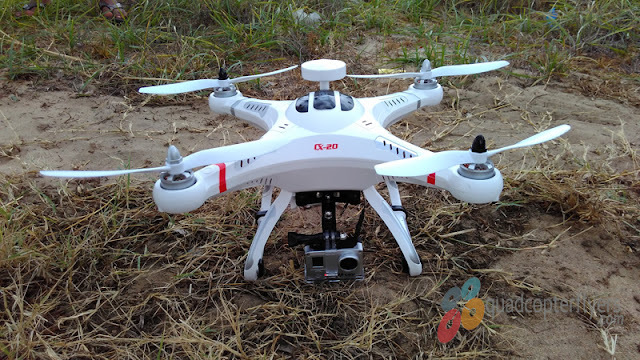 Hi I was just wondering if you have tried this quadcopter with a gimbal? If you have could you recommend one? on the GoPro to watch live video because it would interfere with the radio on the Drone. Is that true? 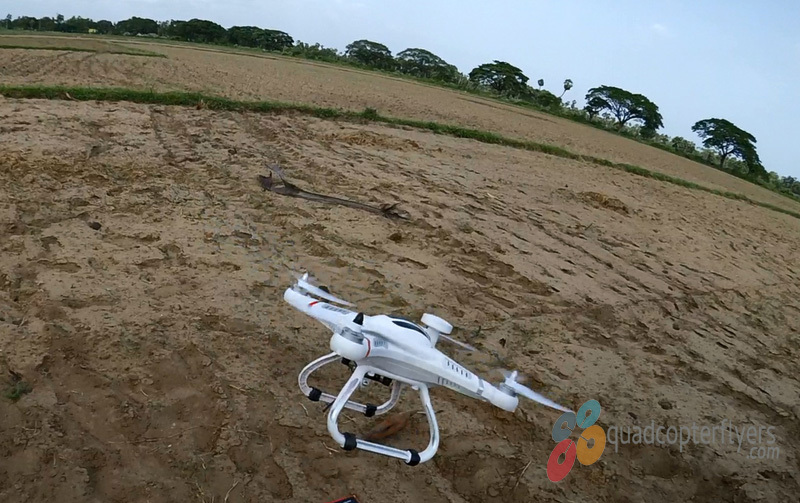 Is it possible to take good pictures without fpv? I mean, how do you know what you're snapping until you land? Hi. 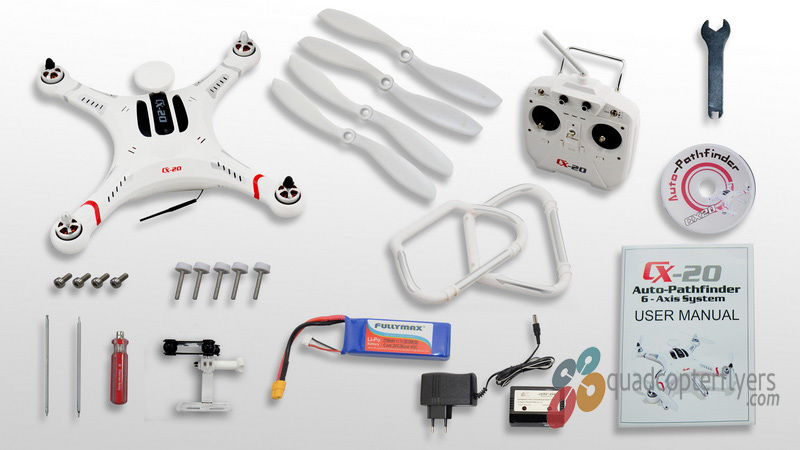 Really interested in this quad but do I need fpv for aerial photography? I mean, how do you know what you're taking until you've landed and uploaded the images. Hi, mine was the same so i invested in changing out the controller to a APM 2.6 with a Ublox-7M GPS module all for £25 from china. With the better GPS mine is now rock solid and responds a lot better.